A small hill site in the charming state of Himachal Pradesh, Paonta Sahib is a famous pilgrimage center for Sikhs and a town filled with oodles of attractions that draw the attention of many a tourist from all across the globe. Erected in the respect of the tenth guru of the Sikhs, Guru Gobind Singh, It is believed that the Guru Gobind Singh Ji lived here for four years. The guru has written that as long as I stayed here relishing the beautiful surroundings, hunting in the wild forests and composing poetry were a perfect experience. Pilgrims can also enjoy the salubrious climate, verdant beauty and tall evergreen trees around the holy shrine. There is a big darbar inside the complex of the temple where guru would sit with 52 poets. Another attraction is Sri Talab sahib where Guruji would hand out earnings to his soldiers. It holds spiritual significance amongst Sikhs. The temple has a book called Dasam Granth, which is written by the tenth guru of Sikhs, Guru Gobind Singh Ji. It is said that Guru got impressed by the warm welcome from the king along with his merchants and whole singh worshippers and as a result decided to stay here for at least 4 years with his horse. He wrote many books during his stay at Paonta Sahib and then left for Anandpur Sahib to create the Khalsa Panth. In addition to this, the Gurudwara has a museum where visitors can have a glimpse of weapons used by Guruji at those times. 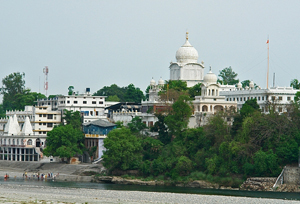 Gurudwara Bhangani Sahib: Just 6km from Paonta Sahib, Gurudwara Bhangani Sahib is an attractive place amidst the natural surroundings. It is the destination where Guru Gobind Singh Ji defeated hill chieftains. Lacs of devotees pay a visit to this shrine every year. 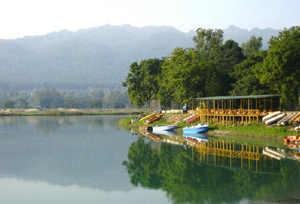 Assan Lake: A refreshing place in proximity to Paonta Sahib, Assan Lake has a number of exciting and thrilling activities to entice the tourists thronging from wide and far. Besides this, travelers can plunge in a wide array of cuisines offered at the restaurant located within the premises of the lake. Fossil Park: Positioned on the banks of Markanda River about 30 miles from Paonta Sahib, Fossil Park has beautifully put on view flora and fauna's life in its museum. Sirmour: A quaint site in the state of Himachal Pradesh, Sirmour is renowned for its assorted architectural ruins. It is believed to have been devastated in the 11th century owing to deluge. Simbalbara Wildlife Sanctuary: Another famous attraction is Simbalbara Wildlife Sanctuary which is nestled hardly any distance from the Paonta Sahib. It is visited by many ornithologists and bird lovers throughout the year. The summers are hot with an average temperature of 35°C, while the winters are chilly with a maximum temperature of 15°C. The ideal time to pay a visit to Paonta Sahib with friends or families is from mid May to mid October. By Air: Jolly Grant Airport at Dehradun would be the closest to make it to Paonta Sahib situated around 40 miles away. One can take a bus or a taxi from the airport to the beautiful town. By Rail: The closest railway stations are situated in Yamuna Nagar and Dehradun, which are 56 km and 45 km away. By Road: The town is well connected to main cities of India by excellent motorable roads. Regular bus services are available from Dehradun, Chandigarh, Shimla, Nahan and some more.